After Falling Hard, Is Francesca's Ready to Soar? Shares of Francesca's Holdings plummeted after releasing earnings results for the first quarter of its 2014 fiscal year. Because of this drop in share price, is now the time to pounce on its shares on the cheap or would a stake in Urban Outfitters or Abercrombie & Fitch make more sense? After reporting revenue and earnings for the first quarter of its 2014 fiscal year on June 10, shares of Francesca's Holdings (NASDAQ:FRAN) plummeted 11% to close at $13.55. With the retailer's shares trading just 3% off its 52-week low and 54% below its 52-week high, is now the best time to jump into a position at a discount? Let's take a look and see if rival retailers like Urban Outfitters (NASDAQ:URBN) or Abercrombie & Fitch (NYSE:ANF) make for more interesting prospects. Francesca's couldn't meet analyst expectations, but it still did great! For the quarter, Francesca's reported revenue of $85.4 million. Although this represented an 8% increase over the $79 million management reported for the first quarter of its 2013 fiscal year, the business fell short of the $88.1 million analysts anticipated. According to Francesca's press release, this increase (but still a miss) in revenue can be attributed to a 23% jump in store count from 416 locations last year to 513 this year, 62 of which were opened in the past quarter alone. This larger footprint was unfortunately offset by a 7% decline in comparable store sales for the quarter. Looking at profits, Francesca's continued to disappoint. For the quarter, the business reported earnings per share of $0.20. In addition to missing the $0.22 analysts forecasted, the company's bottom line came in 17% below the $0.24 management reported the same quarter a year earlier. Even though revenue for the quarter was higher, Francesca's saw its earnings per share fall because of its cost of goods sold rising from 47.6% of sales to 51% while its selling, general and administrative expenses rose from 29.6% of sales to 32.6%. For the year, management expects the company to report revenue and earnings per share of between $387 million and $399 million and $1.05 to $1.17, respectively. This flies in the face of the $1.21 per share Mr. Market has been hoping for and might make the $397.9 million in revenue previously forecasted by analysts seem like a stretch. Is there a better play than Francesca's? The past few years have been quite a success story for Francesca's. Between 2009 and 2013, the retailer saw its revenue jump 329% from $79.4 million to $340.3 million. This rise in sales was driven mostly by the company's store count, which soared 207% from 147 locations to 451. However, management also attributed some of its success to the 61% aggregate improvement the retailer saw in its comparable store sales during this period. From a profit standpoint, Francesca's results have been just about as impressive. Over the past five years, the company saw its net income skyrocket 323% from $10.6 million to $44.8 million. This rise in profits was mostly due to the higher revenue Francesca's reported. It was negatively affected by the retailer's cost of goods sold, however, which rose from 46.9% of sales to 48.3% during the five-year timeframe. 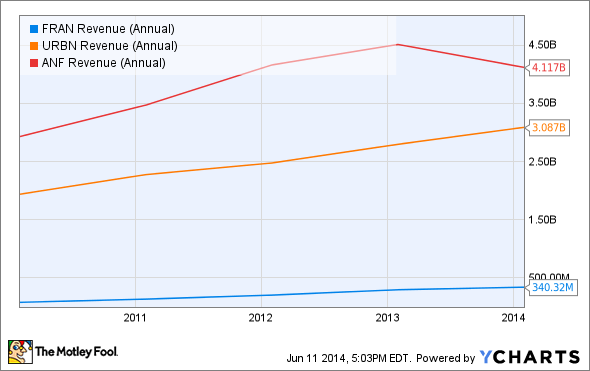 Over the past five years, rival Urban Outfitters also did well, but not to the extent Francesca's has. Between 2009 and 2013, Urban Outfitters saw its revenue climb 59% from $1.9 billion to $3.1 billion. This rise in sales was due, in part, to a 10% increase in aggregate comparable store sales, but was mostly attributable to a 56% jump in store count from 327 locations to 511. From a profitability perspective, Urban Outfitters did alright but nowhere near as well as Francesca's has. During the past five years, the retailer saw its net income rise just 28% from $219.9 million to $282.4 million. This rise in profits came from the company's higher revenue, but it was more than offset by soaring costs, primarily in its cost of goods sold, which rose from 59.4% of sales to 62.4%. Another interesting retailer in recent years has been Abercrombie & Fitch. Between 2009 and 2013, the company reported a 41% jump in revenue from $2.9 billion to $4.1 billion. Despite seeing its aggregate comparable store sales fall 24% during this period while store count declined 8%, management has had tremendous success in growing the retailer's e-commerce operations by 168% from $290.1 million to $776.9 million. 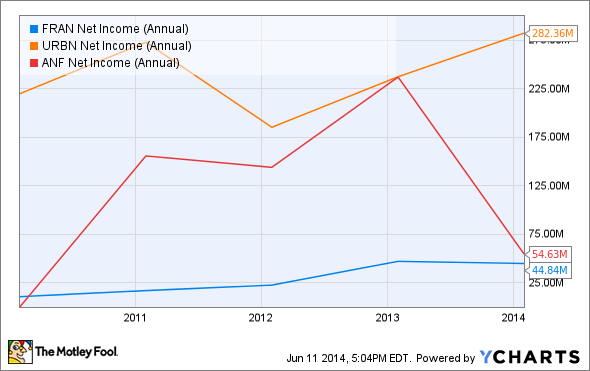 Looking at profitability, we can also see that Abercrombie & Fitch has done pretty well. Between 2009 and 2013, the company saw its bottom line grow from $300,000 to $54.6 million. However, if you remove extraordinary charges in both years and strip out the $78.7 million in 2009 that was booked as a loss from discontinued operations, Abercrombie & Fitch's profits rose from $87.9 million to $133 million. Based on the data provided, it's pretty clear that Mr. Market wasn't happy with Francesca's performance this quarter. While it is unfortunate that management reported revenue and earnings that missed forecasts, it's imperative to keep your eye on the big picture. Over the past five years, the retailer has seen strong growth in terms of both revenue and earnings. These are both expected to hit record highs by the end of its current fiscal year. This, combined with where the company's shares are currently trading at, suggest that a stake in the business may make some sense for the Foolish investor moving forward. This is especially the case when you consider interesting (but not necessarily stellar) alternatives like Urban Outfitters and Abercrombie & Fitch.